Sounds simple right? 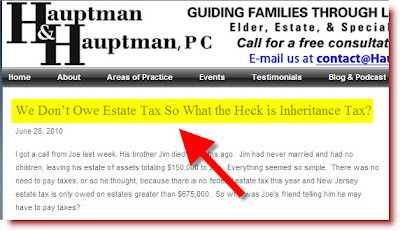 The problem is that many attorneys create blogs without a clearly defined goal and strategy. Here are some critical elements to consider: Are you posting consistently? Who is creating the blog posts? What are the topics of the posts? And most importantly: Is the information I am posting useful to my target audience? For example, if you are a criminal defense attorney – do people want to know about your weekend or are they more interested in changes in the DWI laws? If you are a divorce lawyer, do your prospective clients want to know about how many people got a divorce last month or how you can protect their assets in a divorce? These are just a couple of examples to illustrate a key point: people will follow your blog only if you give them a reason to. The best reason is to provide them with USEFUL information. 2.) Create a Keyword Rich Subject Lines. Many people search online based on words and phrases that come intuitively to them and are related to the topic. The subject line of your blog post creates what is called a title tag for that page which is analogous to the title of a book in importance. Because of this, you need to create a subject for your blog post that contains the keywords related to your article and in a manner that is interesting, brief and compelling. If you have a blogger blog, you need to change the rendering order of your title tags first. Since most people will determine whether or not to read your blog post based on what they see in the subject line, make sure you carefully review it and do not publish until you have determined that it contains commonly used keywords, is interesting to a potential reader and is compelling. 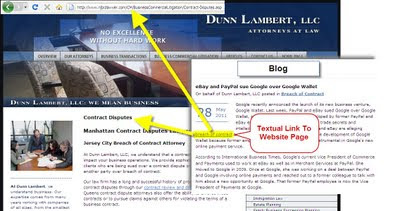 Most attorneys have blogs to help support the authority of their websites. Since your website is your main conversion tool, blogs will commonly lead readers to websites for better conversions. One of the most important ways to lead a user to your website and build up the authority of your website at the same time is to create at least 1-2 textual links from each blog article to various pages within your site. 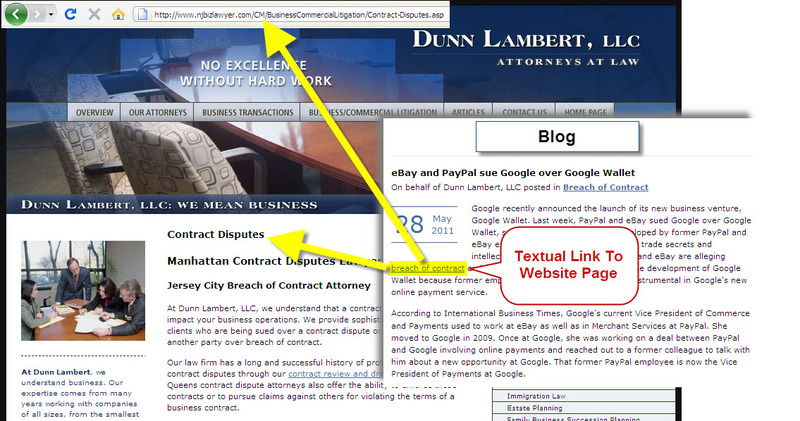 For attorneys, these are commonly your practice area pages. You should always finish a blog entry with a suggested next step (or call to action). If you took the time to optimize your blog entry to grab readers, make sure you providing them with next steps after they read the article so you can improve your conversions. There is a reason why almost every product commercial on TV ends with “Call Now” – it tells the viewer what to do next. Your blog entry should do the same thing. Keywords and phrases that are important enough to include in the subject line of your blog post should also be repeated in the content of your blog post. The search engines not only index based on the prominence of the keywords (in the subject line) but also based on the density of the keywords repeated throughout your entries. It is a good idea to repeat these words and phrases at least 2-3 times in a typically 500 word entry but don’t overdo it – you don’t want to look to SPAMY to the search engines. It is also a good idea to substitute similar words and phrases as well to grab a bigger potential search such as: Attorney or Lawyer, Car or Automobile, Injury for Accident, etc. Just because a user may have found your blog now doesn’t mean they will find it again or remember you. With all of the various websites and blog the typical user visits, you cannot expect that all visitors will all proactively continue to come back again and again. Since over half of Americans now have Facebook accounts, it is important to now create your own social media properties and links to these accounts from each blog post so they can simply click a “Like” button once and will be able to follow your blog in their Facebook News Feed Page in the future. With an active content strategy, you can now have your blog posts automatically feed your content to your Facebook Page, Twitter and LinkedIn page where people can see you on a consistent basis. Contact Us if you would like to learn more about lawyer marketing online and how we can help your law firm generate more clients and cases for your practice. Great read, very use info here. I will definitely bookmark this site for future reference. keep up the good work! Hi! This is a great compilation. Thanks for taking the time to creating a most popular article for all of us. Nice postings here my friend. Like it. That's a great read, not lengthy though effective! Thank you for sharing the worthy information.